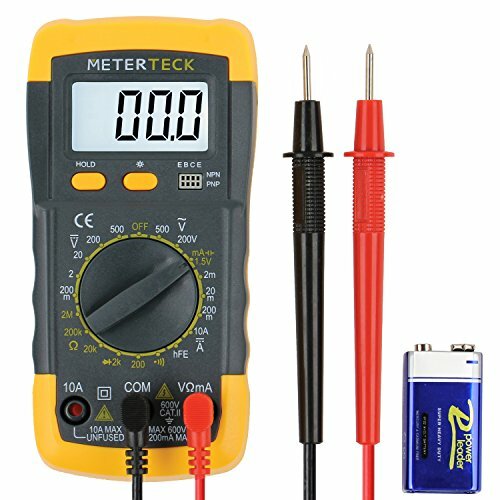 An essential, practical tool for professionals, electricians, hobbyists and general, household use, the Meterteck MT-001 Digital Multimeter is exceptionally easy to operate. It can be used to assemble, diagnose and repair circuitry and wiring. The Meterteck MT-001 measures DC current, AC/DC voltage, resistance, continuity (buzzer), transistor and diodes, with unprecedented accuracy. • Pre-installed 9V battery & TWO Test Cable Sets. Each Meterteck MT-001 Digital Multimeter Comes with a superior, 1 YEAR WARRANTY. Click Buy Add To Cart While Supplies Last!